Breakfast doesn't get better than this. Shyam Sweets in Chawri Bazaar, Old Delhi, probably serves the best bedmi puri in the Walled City. 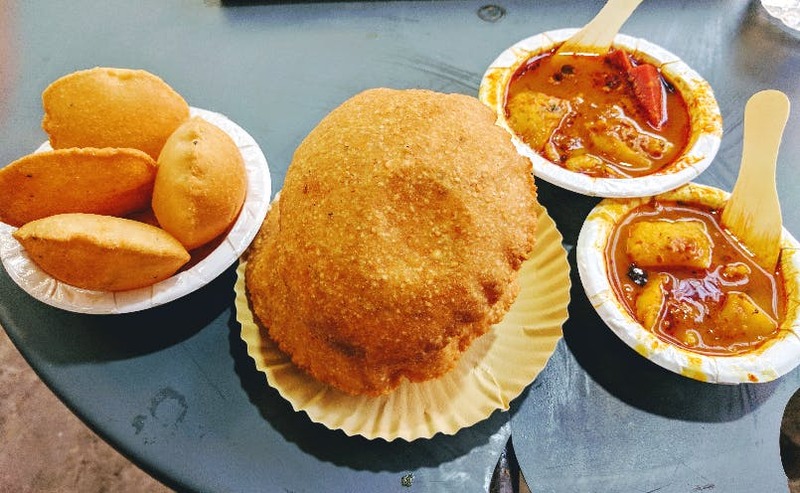 Bedmi Puri is a very popular Delhi breakfast. Deep fried and crisp, Bedmi Puri is prepared from wheat flour and urad dal. It is served with aloo sabzi and carrot pickles. On Sundays, they also serve kaddoo sabzi. Another popular breakfast that is served here is nagori puri aloo and halwa. Nagori is a small, crispy, crumbly puri made with suji and ghee, which is served with aloo sabzi and kesar halwa. When you are here, order both and enjoy the savory-sweet combination of bedmi aloo and nagori halwa. Bedmi Puri aloo and other breakfast options are available only till noon. Shyam Sweets was established in 1920 by Babu Ramji and is currently run by fourth generation owner, Sanjay Agarwal. Shyam Sweets is located at Barshahbulla Chowk near Chawri Bazaar Metro Station.